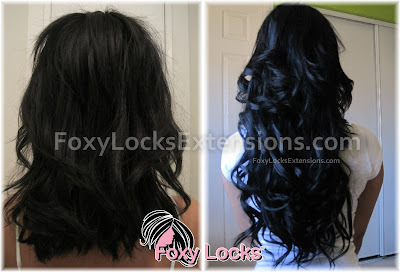 I wanted to share an in depth look at Foxy Locks Extensions, there are so many different kinds of extensions out there that i wanted to show you what makes Foxy Locks amazing. One of the great things about Foxy Locks is that they are made soley for Foxy Locks, meaning you can't get the same anywhere else which means you will always be getting the same high quality product from a trusted retailer. There are lots of different factors that determine high quality hair extensions, as soon as you receive your extensions you will know what kind of quality they are just by touching them. I will be showing #1 Jet Black and #60 Light Ash Blonde - the darkest and the lightest colour from Foxy Locks, to show you the quality is not compromised by the colour. Foxy Locks are 100% human Remy hair - this is the highest quality hair on the market. All the cuticles of the hair are running in the same direction which means they are tangle free and silky soft to touch! The great thing about human hair extensions compared to synthetic is that they look natural against your own hair. Synthetic hair usually has a very unnatural 'plastic' shine to it. Remy human hair has a beautiful natural sheen that shows the hair is extremely healthy. They completely transform any hair! After lots of research these are the best clips, they are small yet sturdy with a silicone strip that grabs onto your natural hair to stop them slipping. The silicone also cushions the hair for minimal damage. They are sewn tightly to the weft to keep them in place. Foxy Locks aim was to supply some of the thickest hair extensions on the market, allowing woman all over the world to feel ultra glamorous with their new thicker hair. Foxy Locks offer two different kinds of thickness at this time, depending on what you are trying to achieve. The difference is only the weight. All the extensions are the same high quality. If your hair is fine and/or you are looking for mainly length and some volume then Foxy Locks 120grams set should be suitable for you, this amount of hair is suited to finer hair as it should be all you need to get volume and length. The 120g are also great for woman with curly hair as once curled they appear thicker. If you are looking for lots volume as well as length or your hair is naturally thick then Foxy locks 160grams should be for you, this set provides even more hair. It will blend in with naturally thick hair and create lots of volume for all hair types. Foxy Locks come with 10 pieces as standard. 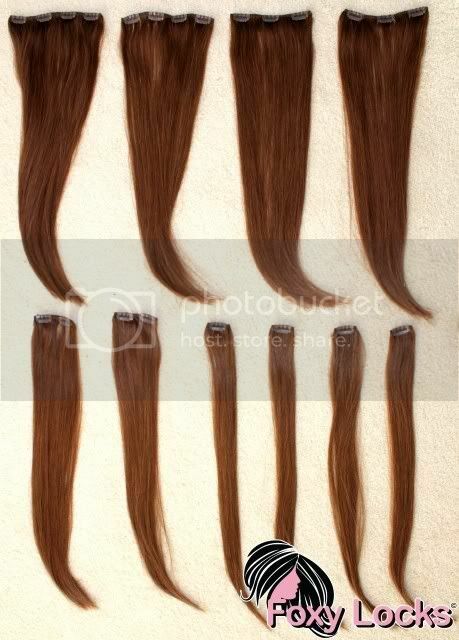 The wefts have been thoroughly thought out to be suitable for all head shapes, hair types and for the ultimate blending. The more wefts you have the better your hair extensions will blend as you are evenly spreading the wefts across your head. The wefts are sewn tightly to prevent minimal shedding and to keep them sitting close to your head once clipped in. Foxy Locks are always improving their hair extensions, the ends are a big factor in making extensions look natural. 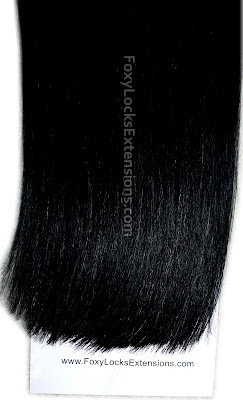 The ends are very natural looking and have the fullness needed to make them look thick and seamless with your hair. Super thick natural looking hair extensions of the highest quality! This review is very helpful! These hair extensions are on my must have list. They current ones i have are thin and slide down my hairmaking it feel very uncomfortable. Thanks for the review and extra info on this. I think the selling points for me is the thickness, how many it comes with but the quality of the hair. Imogen please stock a lighter blonde than the 60's. I love these & have had mine for 12 months now, but i have to dye them lighter! I am definately buying my extensions from you next time!!! Visit my new blog and win 4 mini beauty products for your handbag! Hi imogen your foxylocks look fantastic! With all extensions ive had in the past ive had to buy a few sets and sew them together to make them thick enough otherwise they are too thin to blend with my natural hair as you can see a clear line between my hair and the extensions. Would you think the 160 set would be sutiable for me? Are they thick enough to not see the difference between the natural hair and extensions? Also when ive looked on the site everything seems to be out of stock? Will they match my Mixed race hair texture? I cannot wait to get some! I should be ordering sometime this week and I am so excited. I've been through so many extensions but I have such thick hair that they always look even faker than Selena Gomez's but the 160g set looks perfect! Imogen! I am in love with all your Youtube videos and your hair styles! Your so beautiful and such an inspiration! I was just wondering how long the foxy locks will take to get to Arizona because that's where I live. Alright, you've convinced me! I will be asking for these for Christmas I really want the Imogene Highlights, cuz they look amazing on you!